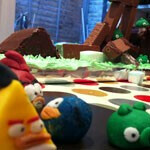 The game with the angry little birds is no longer popular only in its software versions since a creative father from UK named Mike decided to surprise his son Ben by making a great cake that was just like the setting of a level of the game. But instead of stone and rocks the cook used cream, chocolate and caramel thus letting his 6 year old son eat the remnants of the green pigs’ base. At the end of the cake there was even a small catapult that fired little models of the birds from the game made of icing that were used as ammunition, which was certainly a source of fun even for people that are well beyond their childhood years. If you fell disappointed that there isn’t anyone in the near vicinity that possesses the skills to make such a surprise for you, you can try making the cake by yourself using the instructions provided by Mike. Below the news is a video with chosen moments from the process of creating the cake (that took 10 hours altogether) and a glimpse of the two minutes that were needed for its destruction.